THE SPOTTED HARE: Have a Happy Heart . . .
Have a Happy Heart . . . Happy Valentines Day!! Your creations are just lovely!! Il est trop beau ! J'adore ! 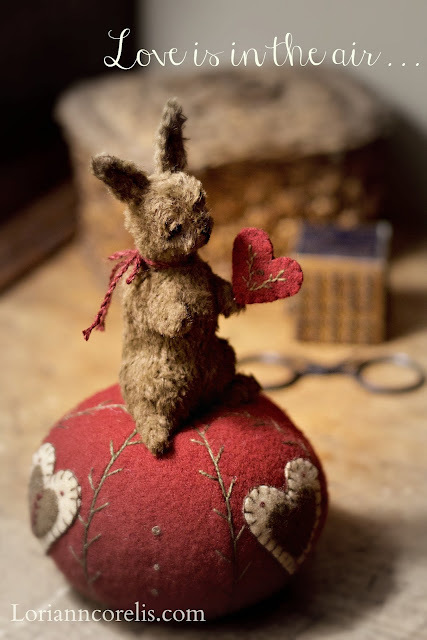 Such a sweet little Valentine Bunny, love the colors. Hope you are doing better Lori😊glad to see your bunnies. Your work is beautiful! I had a dream about handmade rabbits displayed on shelves that reached twelve feet up! I bounced and bounced, on my feet until I could see all of them, and then I flew up to the top shelf and fell in love with all of the rabbits in clothing, and displayed as though they were in a huge doll house. (Yes, I have dreams where I fly!) I love dreams like that so I went online and did a search on handmade rabbit images and found your sweet blog. Nothing is coincidence when one is a creative soul!